Kyr­gyzs­tan. A coun­try with spec­tac­u­lar nature, kind-heart­ed peo­ple… and super afford­able! In our 23 days of trav­el­ling the coun­try we spent only 820€. For two peo­ple. That make just 410€ per Per­son — an aver­age of 18€ per Day! 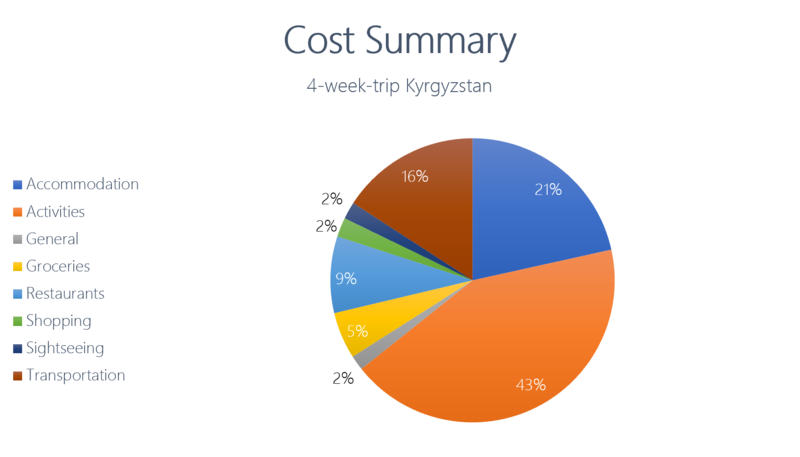 Well, here goes a com­plete cost report of our trip through Kyr­gyzs­tan. I hope it will help you plan your bud­get for your trip to this amaz­ing des­ti­na­tion. Note: I trav­elled Kyr­gyzs­tan for a total of 5 weeks. Since my sis­ter left me after 23 days, how­ev­er, I only includ­ed those expens­es as most of you will like­ly trav­el as a pair as well. Of course, it is always cheap­er to trav­el with oth­er peo­ple as you get to share many expens­es like trans­porta­tion and acco­mo­da­tion. If you are a solo trav­eller you might want to team up with some oth­er peo­ple so save mon­ey. With 177€ in total, accom­mo­da­tion was our sec­ond high­est expense. Since we had brought our own tent we always tried to camp for free as often as pos­si­ble. If that wasn’t pos­si­ble we usu­al­ly chose sim­ple guest hous­es or hos­tels. Some accom­mo­da­tions, like the Trekking Cen­ter in Bokon­bae­vo, were more expen­sive but includ­ed full-board. In those cas­es we didn’t need to pay for any food which put the high price into per­spec­tive. More­over, we got invit­ed by our friend­ly hosts to stay in their yurts or guest rooms for free a cou­ple of times. This way, in our three weeks of trav­el­ling, we only stayed in a payed accom­mo­da­tion for 16 nights. As you can see, our aver­age cost per night was 11€. Divide that by two and you end up with a ridicu­lous­ly cheap 5.5€ a night per per­son. Impor­tant to note is that this does not mean that we stayed in dirty, run­down 20-bed hos­tel dorms. Most of the times, we got a nice lit­tle dou­ble room and if we did end up in a hos­tel dorm, the own­ers usu­al­ly tried to put you in an emp­ty one so you nev­er real­ly had to share rooms with more than one or two oth­er peo­ple. Kyr­gyzs­tan has a very func­tion­al infra­struc­ture as long as you keep to the main tourist routes. As soon as you veer away from them you are often left with lit­tle to no trans­port options. That’s why often our only choice was to take a taxi. How­ev­er, these always require a set price in advance (unless in Bis­chkek) and are very afford­able. For long dis­tances, we always tried to take Marschrutkas; small mini busses that have a (more or less) set time table and shut­tle between big­ger cities and towns. Every­one pays the same price and it leaves once the bus is full. Pret­ty much any­thing below the Issyk Kul, how­ev­er, has very bad infra­struc­ture. As the coun­try is very moun­tain­ous, the streets often wind up and down the pass­es in nar­row hair-pin bends and are dan­ger­ous in bad weath­er. As of 2018 there were no main bus lines con­nect­ing the south with the north. In those cas­es we paired up with oth­er trav­ellers and locals and paid for a shared taxi. In total, we still only spent 130€ (65€ per per­son) for trans­porta­tion in three weeks of trav­el­ling across the whole coun­try. And that we did… Activites were our largest expense by far. With just 351€ in total, or 175.5€ per per­son, we did a whole bunch of amaz­ing things. The most expen­sive one was a 4-day-horse trek but the price includ­ed three nights in yurts, full-board, trans­fer from and to Naryn, the hors­es and the gear as well as the pay for our love­ly guide Nar­giza. All in all, a very fair price. And let’s not for­get that we bought the three fluffi­est, sweet­est and most stub­born don­keys in all of Cen­tral Asia (at least) to take on a trek through the beau­ti­ful scenery of the Naryn region. While Kyr­gyzs­tan is a coun­try where you can eas­i­ly just explore the nature and nev­er spend a sin­gle cent on orga­nized activites, I high­ly rec­om­mend to try at least a few. You will remem­ber the deli­cious Lag­man you cooked up with the two old Kyr­gyz ladies for the rest of your life — promise. The Sight­see­ing-Cat­e­go­ry includes all our entries and things that didn’t real­ly count as an activ­i­ty. That might be a muse­ums entrance or the entry fee for a nation­al park. These are usu­al­ly very small expens­es. The aver­age entry fee seemed to range some­where between 100 and 200 KGS. Since Kyr­gyzs­tan is a very cheap coun­try we usu­al­ly didn’t both­er to cook up our own meals and ate out most of the times. Our gro­cery expens­es are made up main­ly from ice tea pur­chas­es, to which we both got strange­ly addict­ed on our trip. On top comes all the food we bought in advance to take on our longer treks and quick lunch­es from the mar­ket con­sist­ing of fresh­ly baked bread with some cheese and veg­gies. Throw in the occa­sion­al snacks and ice creams and we end up with a whoop­ing 44€ or 22€ per per­son. As I men­tioned before, food is very cheap in Kyr­gyzs­tan and so we often ate our meals in small restau­rants. Kyr­gyz meals are very diverse and com­bine ele­ments from both Asian an Euro­pean cui­sine. Skip the touristy places with burg­ers and piz­za and try to find those places the locals vis­it as well. You can get a full table of deli­cious tra­di­tion­al food for less than 5€ at these and in addi­tion you get to see the real Kyr­gyzs­tan. An aver­age meal cost us just 3€ per per­son and in total we spent 71.5€ (35€ per per­son) on restau­rants on our whole trip. While I did do my fair share of sou­venir shop­ping in Kyr­gyzs­tan, this cat­e­go­ry only includes rel­e­vant pur­chas­es such as maps, sim cards, laun­dry and fuel for our camp­ing cook­er. Note: I dis­re­gard­ed my clothes and sou­venir pur­chas­es as not every­one enjoys shop­ping. These expens­es were pure extra lux­u­ry, just like oth­er peo­ple pay more for the occa­sion­al alco­holic drink or for a spe­cif­ic hob­by like div­ing. That’s why it’s always a good idea to reserve a lit­tle bit of mon­ey for those lux­u­ry pur­chas­es when plan­ning your bud­get.